It’s beginning to look like this Portage Island Cliff 6×6 series will only be about half done by the Labor Day Lummi Island Artists’ Studio Tour. I’ll have whatever is finished on display at my home, and I’ll complete the series before the mid-November Holiday Studio Tour. I hope you’ll stop by to see the progress! 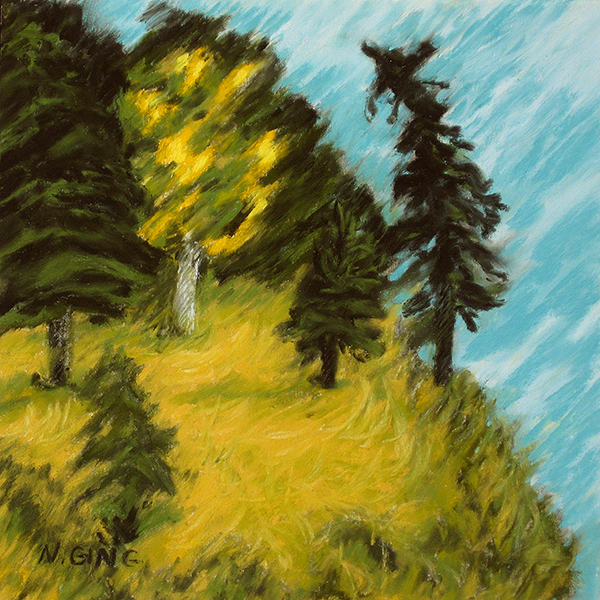 For the eighth painting in the series (shown above), I used a pastel technique where the image is made using mostly diagonal lines. I think it gives an energy to the piece that goes well with this wind-swept theme. This technique from drawing is particularly well suited to pastels, since the method of applying pastels with a dry stick is very similar to methods of applying graphite or charcoal. It takes a lot of practice to achieve a feeling of depth and roundness using straight lines. I used some curving lines and lines in directions other than diagonal to finish the piece. I still tried to keep to textural lines throughout, though. I really enjoy studying the paintings of Emily Carr, a well-known Canadian artist. Emily lived most of her life nearby in Victoria, B.C. Her work is strikingly stylized, yet realistic. I’m inspired by her ability to convey the way light behaves in deep woods. She loved Nature and conveyed her experience of the natural coastal areas of British Columbia with remarkable emotion. Recently I’ve been particularly studying how she painted trees. Some, such as her painting “Deep Woods”, seem almost dashed off and sketchlike until I look at the careful and meticulous way she used color.to give shape to the tree forms. Today I was thinking of her work as I did this ninth painting (above) in the Portage Island Cliff 6×6 series. I think it improved my rendering of the large evergreen on the left. What do you think? I like the way the flowers turned out as well. 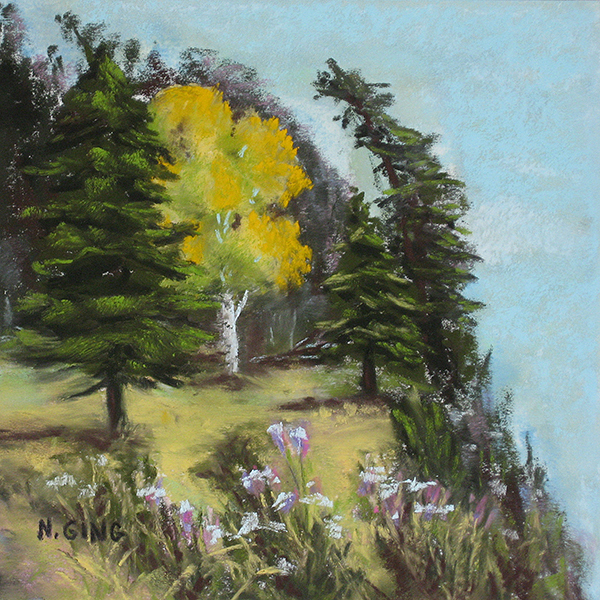 Click to see all Portage Island Cliff 6×6 Series pastel paintings together. Filed under Blog. Tagged diagonal lines technique, Emily Carr, landscapes, painting trees, pastel paintings, Portage Island Cliff 6x6 series.